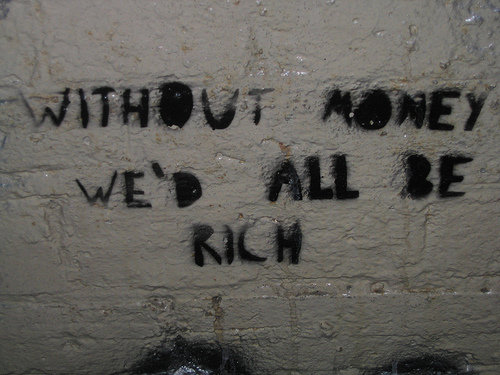 Without money we'd all be rich! Over the years and the past century, inequality of wealth has become a major political issue. Developed nations that are rich and well-off, such as the U.S., tend to ironically have the largest disparities in wealth and this gap is only just widening year after year. Anti-poverty organisation, Oxfam, recently reported that global wealth inequality is continuing to rise and latest figures show extra-ordinary results as the gap between the ‘rich’ and the ‘poor’ widens. Oxfam suggested that the 8 richest men in the world, containing the likes of Bill Gates, Mark Zuckerberg, Amancio Ortega and Warren Buffet amongst others, own the same amount of wealth as 3.6 billion people! That is almost the same wealth owned by 50% of the world. Previously, Oxfam has predicted that the top 1% would eventually overtake the rest of the 99%. According to BBC, It takes cash and assets worth £48,300 to get into the top 10%, and £533,000 to be in the 1%. This essentially means that if own an average house in London with a mortgage, you are probably in the 1%. “Instead of an economy that works for the prosperity of all, for future generations, and for the planet, we have instead created an economy for the 1%,” Oxfam’s report says. The report has led to an outcry amongst activists to urge global leaders to urgently act upon this issue however; any serious action against this by those in power is highly unlikely. Currently, 1 in 10 people in the world survive on less than $2 per day while the richest man in the world is valued at over $80 billion. While it is worth acknowledging the efforts of entrepreneurs such as Bill Gates and Mark Zuckerberg, who have pledged to donate 99% of their wealth towards human development, alleviating poverty and sickness and philanthropy, this does not however solve the issue of reducing the inequality and raising standards of living of those across the globe. To achieve true equality, opportunities for equal pay, employment and development of skills must all be present. The data from Oxfam was released at the annual World Economic Forum event in Davos, Switzerland, a meeting between the business and political elites. It can often be assumed that rich and wealthy nations, such as the U.S.A., have lower levels of poverty and inequality than poorer countries. However, a report released by the World Economic Forum committee concluded that although the U.S. is one of the wealthiest nations, it is also amongst the most unequal, ranking in at No. 23 out of the 30 developed countries amongst inequality. Such countries need to effectively implement the necessary reforms to allow for a more sustained and uniform future growth of an economy. Some of these reforms could be in the form of higher taxes on the wealthy, a crackdown on corruption and deposits in tax havens including Panama and providing efficient training and education to those less fortunate. If not, then what other policies and systems can we bring in place to actually bring about the change desired? Some of the more extreme measures that are being tested include providing a basic universal income, such as that being implemented in Finland however, this is costly and is only successful if the rich are paying their due taxes, which brings us back to square one. Are they? Inequality is an issue that needs to be urgently addressed by our leaders and should be trickled down to communities, societies and individuals alike. Inequality should be addressed in all forms, including pay and gender however, wealth inequality is confining hundreds of millions of people into poverty and damaging education, efficient utilisation of resources, social environment and democracy.